We really like these. They have the expandable elastic insert so they fit almost everybody. 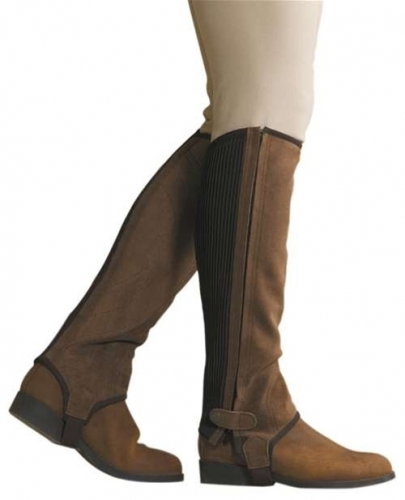 Elasticized area gives these half chaps about 3/4" of stretch. They have heavy duty zippers and a wide variety of calf and height choices along with elastic stirrup and snap at the ankle. Made with nice stiff suede that retains it's shape and gives a more boot-like feel. Sizes: Child's Medium, Large, Adult XSmall, Small, Small/Tall, Medium, Medium/Tall, Large and XLarge.